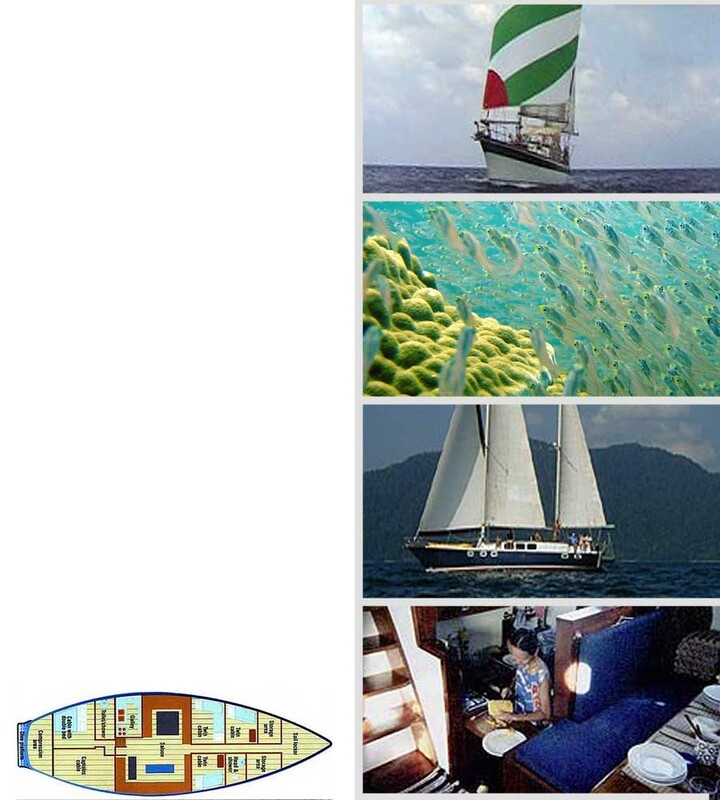 "All Inclusive" adventure sailing trips around the magnificent "Mergui Archipelago". Although the Mergui Archipelago is remote and totally untouched, access is an easy minibus ride from the bright lights of Phuket. Cuisine aboard is a mouth-watering combination of Thai and European dishes with complimentary spirits, soft drinks and cold beers available at all times. All activities such as Scuba Diving, Snorkelling and Sea Kayaking are also included in the price. Exciting New Developments! 2005 - 2006 Charter Season. The Mergui Archipelago comprises hundreds of islands and stretches some 200 miles north from the Thailand border. It is one of the most beautiful and untouched areas in the world and is only accessible by sailboat. The area has some world class Snorkelling and Scuba Diving and is perfect for those who want to have a go. The ancient mangroves that line the rivers and inlets on Lampi Island provide a great opportunity for exploring with Sea Kayaks. The area is truly all the things that postcards promise. If you could paint a picture of paradise, the islands of Mergui Archipelago would be it. These are the islands you'll never find in any travel agents' window... some 800 of them, almost all uninhabited, covered in rainforest and fringed by white sandy beaches. Most are surrounded by pristine coral reefs and all are lapped by the warm turquoise Andaman Sea. They are preserved in the truest sense, boasting a variety of wildlife including monkeys, wild boar and even Elephants. Bird life is prolific, with over 50 species including Hornbills, Egrets, Kites and Fish Eagles. Sailing the Mergui Archipelago is what Sailing Thailand was like 20 years ago; easy, gentle cruising and no other boats!! Although the islands are almost all uninhabited, there are sea gypsies (Moken) who are indigenous to the Mergui Archipelago. These people have lived their nomadic existence in the area for hundreds of years, effectively cut off from the outside world. During the trip we often encounter these fascinating people and have the opportunity to see how they live, despite the modern world. "Adventure" also applies to the sort of places we go and the things we do. Each day we visit a different island and try and do something "out of the ordinary".